Rockaway locals have been shocked to learn that, after a publicly very amicable marriage, two favorite local dessert places are splitting up: Fat Cardinal Bakery and Uncle Louie G’s have shared a space on Rockaway Beach Boulevard for almost two years, and apparently it’s not working out as well as we’ve been lead to believe. We interviewed the respective places on what went wrong, and neither could give a clear answer. “There wasn’t a specific incident that put it over the edge,” says Fat Cardinal’s Tim Cotton. “But I can tell you one thing- that cartoon ( Uncle Louie G’s logo) creeped me out. He’d just be staring at me all day at work. He reminded me of when my Uncle Mario used to get drunk and try to make us shaved ice with ice cubes, egg beaters, and Hershey’s chocolate syrup.” Cotton shudders. “It triggered some rough childhood memories.” “I’m not sure what FC was up to with my ice cream scoop, but they certainly weren’t using it to scoop ice cream,” Uncle Louie G’s Tara Balantino retorts. 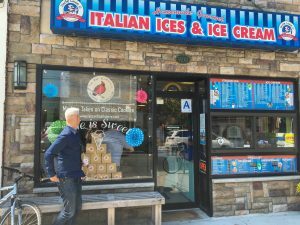 The local dessert spots will each be moving into their own separate spaces: Uncle Louie G’s opened their space 2 doors down Rockaway Beach Boulevard a few months back, and have already hosted several ice-cream centered events, including a Rockaway Business Alliance workshop that was rumored to have gotten a little rowdy when Balantino brought out wine ice cream. Fat Cardinal Bakery will rebrand as Fat Cardinal Provisions in their new space just around the corner on B92, next to Boarders. Balantino just joined the board of the Rockaway Business Alliance, of which Cotton has been a member since 2017. When Rockaway Times staff expressed concern about the feuding couple’s ability to maintain a working relationship in their involvement with the local business alliance, Board Chair Jordan Playdough responded: “I am 100% confident that this board can overcome any petty personal issues and continue to work synergistically. And if for some reason FC and Louie G’s can’t make this happen..” ( he rolls up his sleeves)… “well, I have been known to make grown men cry…” So far, the community’s response to the change has been positive: “This just makes more sense. It was too hard to walk in there and have to choose between an Affogato and that to-die-for brownie. The decision tormented me so much, I found myself avoiding walking down RBB,” says RBA Executive Director Jimmy Dean Ellis. Despite the divorce, Balantino remains positive: “I am so grateful to have had the boys of FCB in my store, in my life and part of my story… once things have settled down a bit, we certainly plan on working together in the future ( does drinking together count as work?? ). And luckily I can see into their new store from mine!” NOTE: With the exception of the last quote, all quotes used in this article are entirely fictional. In fact, the only thing about the entire article we claim to be true is that Uncle Louie G’s and Fat Cardinal are moving into their own spaces. The RBA congratulates them and wishes them the best of luck!